It's almost the start of Summer, and I couldn't be any more thrilled to welcome it. The beginning especially, that perfect feeling of lightness and adventure and possibility and freedom. Is there a better time of year? Number ten is kind of a big one! My best friend and I usually take a girls' trip once a year. For Christmas, she surprised me with a ticket to a destination of our choice and we decided on Mexico. I've only been to visit my family in Guadalajara, never to any of the resort areas. I still need to get my passport squared away, but we already booked Tulum for late August/early September. Ahhhhh! I'm SO excited! 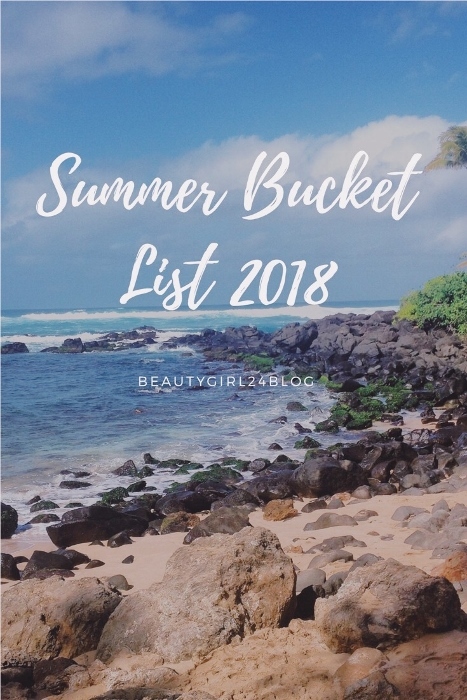 I'd love to know, what's on your Summer bucket list? I hope you can do one of them this weekend! Sounds like a great summer list, and Tulum is so exciting! I never spend as much time at the beach as I should, considering my proximity to it. I should make a point of going more this summer! This is an awesome list and so very doable! If you want to plan a girls hike to Torrey Pines put me down for that. And I can't wait to hear what kind of marketing class you want to take? Through a college or a different type of training? I totally agree about the positive vibes at the beginning of summer - I love it! I'm going on a road trip from San Francisco to San Diego next month! It'll be my first time in California. Any must dos? How exciting Rachel! That is my absolute favorite road trip, to go from SF down to SD. You need to see Big Sur! Actually, that entire stretch of PCH is absolute heaven! Every corner is a photo op! I also really love the SLO and pismo beach area. Santa Barbara, Malibu, Laguna...gorgeous areas along the coast that are beautiful, lined with restaurants, and scenic views. You can’t go wrong just following the coast, it’s the best way to explore California. I hope this helps :) Let me know how it goes! Yeay! Thanks so much! We're hoping to make lots of stops along the way and take it all in. i put a comment here and seems it got lost :( remind me to send you my Tulum rec;s before you leave. You and your bestie will love it there. We are still trying to finish our kitchen and bathroom reno so that is the first on my summer bucket list. Besides that I want to cycle more with my family, spend more weekends away at cottage (so far 3 weekends have been booked), practice yoga in our sunny backyard and last but not least drop the last stubborn 5 lbs!! !